The iOS 7 Jailbreak is already out for download. Users can download latest iOS 7 Jailbreak tool to perform jailbreak on iOS 7, iOS 7.0.1, iOS 7.0.2, or any iOS 7.0.x running firmware version. Evad3rs shocked everyone with this Christmas gift. The evasi0n7 tool is available for both Mac and Windows users. If you are Windows users, then we have already covered a tutorial here for you. However, here we are focusing on the iOS 7 Jailbreak on Mac with evasi0n7 tool. 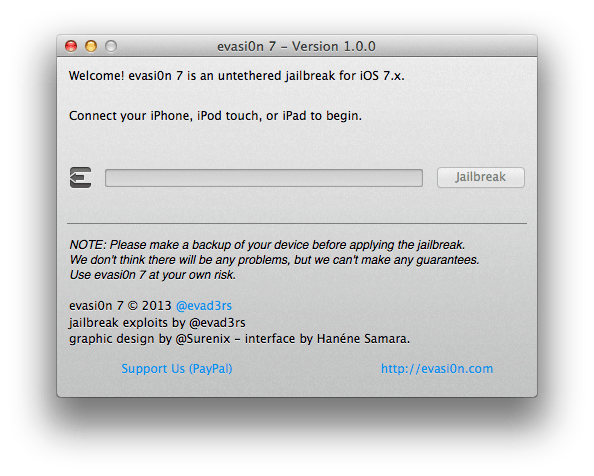 You can easily follow our guide on How to perform iOS 7 Jailbreak on Mac with evasi0n 7. The tool is pretty simple to download and perform the actual jailbreak. It supports almost all iOS devices except Apple TV products. The latest evasi0n brings the very first iOS 7 jailbreak for iPhone 5s devices. Step 6: Launch evasi0n7 on Mac, and make sure that it shows your connected device. Note: If you face any kind of issue with your device, or your iPhone / iPad become unstable. Just restore them with iOS 7.0.4 ipsw and again follow the steps to iOS 7 Jailbreak on Mac.